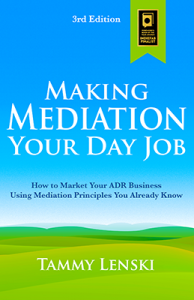 Making Mediation Your Day Job™ was a "blog-to-book" or "blook" project. Writing began in February 2006 and I started offering sections of the book online on my blog in August 2006 to share my ideas, offer my readers a preview of the work before print, and gather feedback. The result was countless comments and emails from readers. Some wrote to cheer me on. Others told me which ideas resonated. Still others told me when I’d missed the mark and how I could make an idea clearer. It all made for a far better book and my concerns about freely giving away my intellectual property before formal publication proved groundless. The blog increased early book sales and for years those blog posts have continued to bring in visitors and help sell my book. Now in its third edition, Making Mediation Your Day Job is continually updated to keep it relevant and immediately useful. Thank you to all of you who’ve played a role in blook project. I am so grateful for your awesomeness and generosity of spirit.